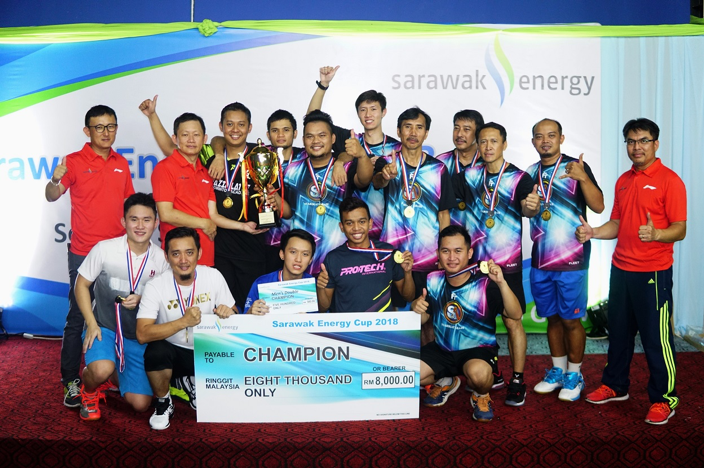 KUCHING, 29 SEPTEMBER 2018, SATURDAY: Team Pebadas emerged champion of the Sarawak Energy Cup 2018 after beating 15 other teams vying for the main title in the badminton tournament, held from 13 to 16 September 2018. The tournament, held annually since 2016, includes Team and Individual events comprising the following categories: Veteran Men’s Doubles, Men’s Doubles, Men’s Doubles (Invitation Category) and Novice Men’s Doubles for the Team events; and Men’s Doubles and Women’s Doubles for the Individual events. Cash prizes amounting to more than RM20,000.00 were on offer across all categories. Under Team events, Pebadas defeated SEB Baleh in the finals to win the Sarawak Energy Cup tournament trophy, RM8,000.00 and medals. Runner up SEB Baleh received RM4,000.00 and medals while joint second runners up Club Ace and CCY A received RM2,000.00 per team. Team Alba BC took home the Sarawak Energy Plate and RM2,000.00, while runners up Tomorrowland received RM1,000.00. Joint third placers, PDRM and CK BMT Club, each received RM500.00 for their efforts. Meanwhile, the Sarawak Energy Shield was won by KBA-KSK, who received RM500.00 while runners up CCY B took home RM300.00. Under the Individuals events, Wendy Tan and Michelle Tan won the Women’s Doubles category, taking home RM500.00, while runners up Alvena and Fateen Shahrizan took home RM300.00. Joint third placing went to Jacqueline and Bong Sook Nee, and Sharon Thien and Hafizah Zulkifli, with each doubles pair receiving RM150.00. Meanwhile, Jonathan Kho and Jeremy Kho beat Kam Sing Siong and Pui Wee Young to take home RM500.00 under the Men’s Doubles category. Runners up Kam and Pui received RM300.00 while joint third placing Kelvin Jee and Aaron Chieng, Lai Zing Neng and Vong Xiang Wei took home RM150.00. In conjunction with Sarawak Energy Cup, a badminton clinic was also organised with former national shuttlers Zakry Latif, Razif Latif and Mohd Razlan, aimed at nurturing interest and developing potential young talent, that attracted almost 150 students on the last day of the tournament. Sarawak Energy’s Executive Vice President for Strategy and Corporate Development Ting Ching Zung presented the prizes at the prize giving ceremony. Also present were Group Vice President for Health Safety Security and Environment (HSSE) Marconi Madai, Vice President for Research and Development Dr Chen Shiun, and senior management. The annual tournament is open to Sarawakians, permanent residents and those holding work or study permits in Sarawak, and is organised to foster closer rapport with potential business partners while promoting a healthy and active lifestyle. Ting (2nd from right), Chen (far left) and Marconi (far right) pose with Sarawak Energy Cup 2018 Champions, Pebadas. Ting (8th from right) with the young shuttlers that attended the badminton clinic with former national players Zakry Latif, Razif Latif and Mohd Razlan. 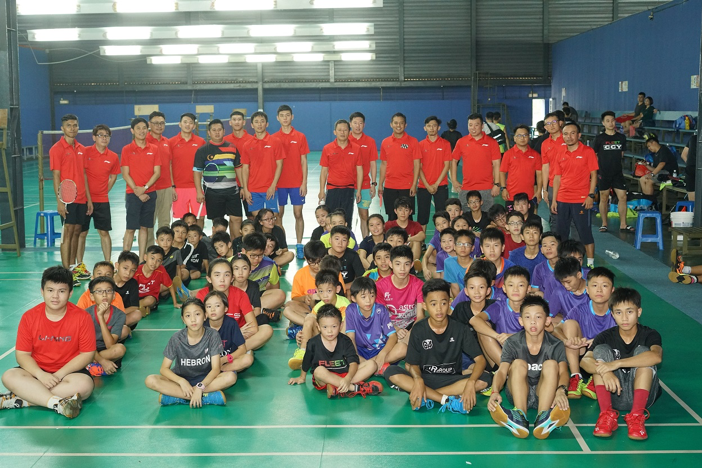 The badminton clinic was organised in conjunction with the Sarawak Energy Badminton Cup.